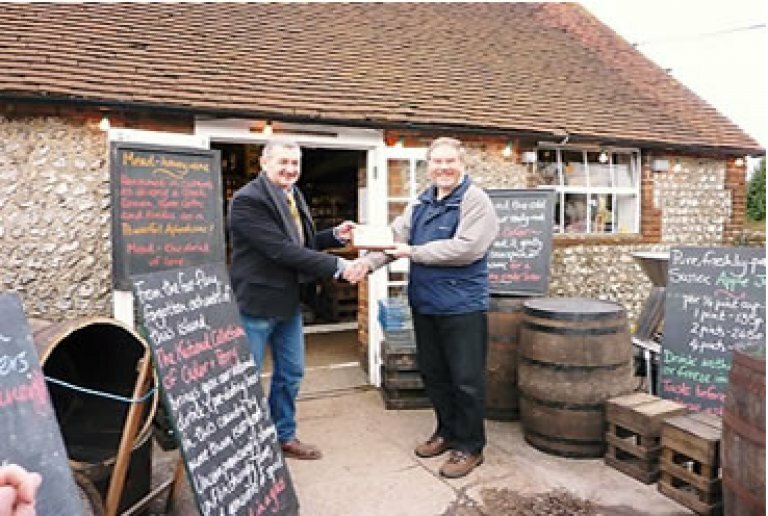 On a cold Saturday in February, after two postponements owing to bad weather, members of the SE Sussex branch met at Middle Farm, Firle to present Rod Marsh and his team with the Best Cider award for the 2009 Eastbourne Beer Festival. After locating Rod amidst a crush of enthusiastic customers, we managed to lure him outside for the presentation by branch chairman Peter Page-Mitchell. In presenting Rod with the plaque (see photo), Peter expressed our delight that their Pookhill Rum Reserve (8%), a truly local cider, was a clear winner in the public vote at the festival. In response, after thanking CAMRA, Rod explained that the unique flavour of the cider was due to the use of rum barrels and that it was one of their most popular ciders. After the presentation, we made our way back into the cider barn and enjoyed some samples of the over 100 different ciders and perries that make up the National Collection of Cider & Perry. We then filled our ‘take-away’ containers with our favourites, including the Pookhill Rum Reserve, and also made purchases of some of the more elusive Sussex beers from the extensive selection of local bottled beers. After making our way out, via the Farm Shop with its mouth-watering selection of local produce, we headed for the Cricketers Arms at Berwick and an excellent pint (or more) of Harveys Kiss and Harveys Old. The large log fire was much appreciated.